The 7th arrondissement (the proper translation is "district" or better yet, "borough") reflects the cosmopolitan character of Paris. Almost a rural area still in the 1850s, its development was boosted by becoming a construction site for the 1867, 1878, 1889, 1900, and 1937 World Fairs. The 7th borough inherited several permanent features from the activities of those the expos: factories and workshops, a reputation for highly gastronomic restaurants and shops and a few relics from the expos like the "Swiss village", a hotel which was once the 1878 Russian pavillion and of course, the 1889 Eiffel Tower. Later, the area began hosting a number of international institutions: many embassies, foreign cultural centers, UNESCO and our own American University of Paris. The Eiffel Tower's second floor offers a bird's eye view (right, upper photo) of almost the entire 7th borough and many other parts of the French capital beyond. 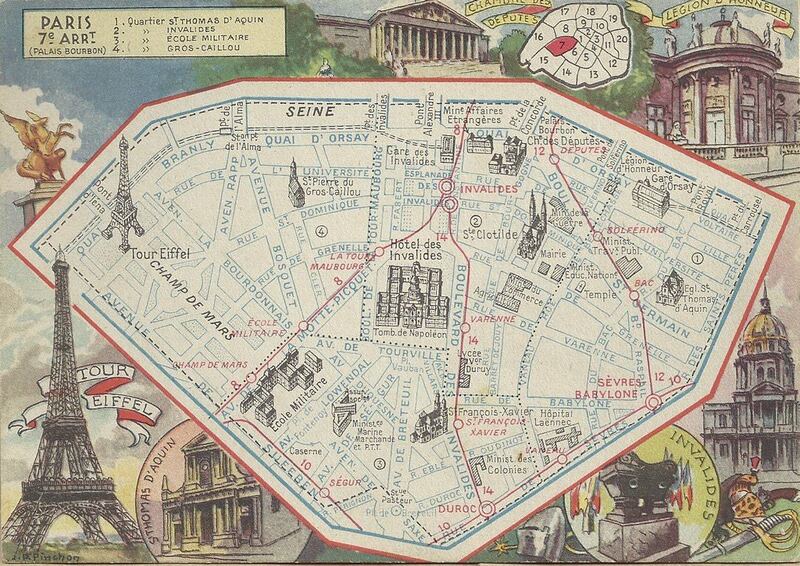 A contemporary electronic map (right, bottom) plus an early 20th century map (below) including all the major monuments of the area allows you to better represent "Paris 7th". ​“Vous êtes nouveau ici?” The question, which I was asked repeatedly through my various walks, rarely rang of condescension. In fact, I would find that it was perhaps asked in one of the only places exempt from the little silences in which one is mutely scrutinized by a local eye. Gentle enquiries such as these were reassuring in a way, providing an odd comfort, as I would stumble inquisitively and erratically through Parisian roads, my course swaying at each corner by sight of a new attraction. I wasn't new, but I was seeing new things: Turkish food stands, Chinese art exhibits, languages I've never heard before walking by a certain embassy. The expectancy of foreigners is the first and most striking experience of the seventh arrondissement. 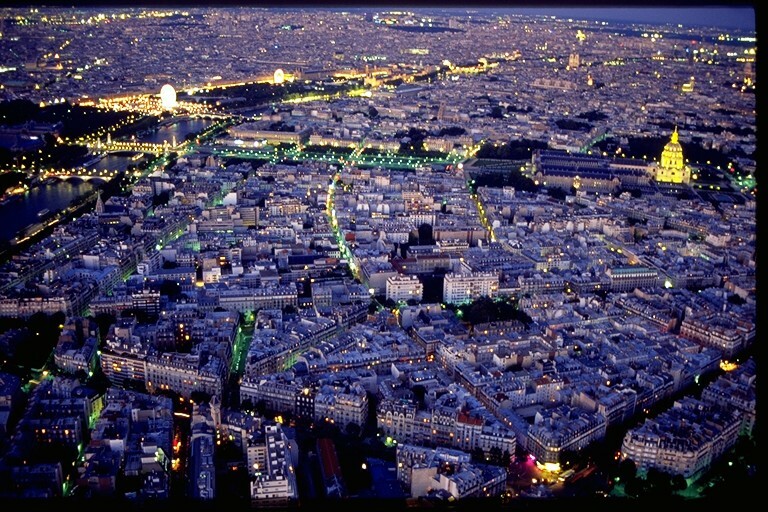 Of the twenty resplendent Parisian districts, none receive quite as much touristic attention as the Seventh. What is it that makes this district stand out? Conceived as an agricultural suburb, the Seventh saw its rise in urbanization as the construction of the Invalides made it an attractive destination for aristocratic mansions. Today, it represents a crossroad for a vast amount of differing cultures and peoples. The coexistence of these forces in relative equilibrium merits attention in a world that is at times cemented in disagreement. To achieve this, I will be looking at a number of important French cultural landmarks, as well as the local foreign influences of an increasingly branching cosmopolitan neighborhood. In 1879, when that year's World's Fair pavilions were disassembled as shown in the contemporary painting above (left), the Field of Mars where now stands the Eiffel Tower (on the right of the painting) and the Grenelle Plain (on the left, near the golden dome) reverted to its aspect of a rural area which, at the time, still characterized these suburban zones that had just become incorporated as the seventh borough of Paris. Development only began at the turn of the century as the 7th attracted international institutions and real-estate investors. The spiral of one of them (above, right, in the center of the photo), the American Church of Paris (also all photos below), rises above the area that rapidly changed into a dense and high-rental area. The Grand Palais, Petit Palais and Louvre are seen just across the river. The neo-Gothic American Church of Paris, achieved in 1931 (all three photos above), is a symbol not only of the American expatriate community but of the culture of diversity of the 7th. An interdenominational institution, it is shared by different Christian groups, including couples travelling all the way from Asia to be married in Paris and particularly in this Church. Charities, concerts, sports activities (in a gymnasium that has been famous since the 1930s) and many other not-for-profit events, great or small, attract Parisians of all faiths and nationalities. Many only come to read the announcements posted on the bulletin board or simply to "hang out" in the courtyard (above, left). 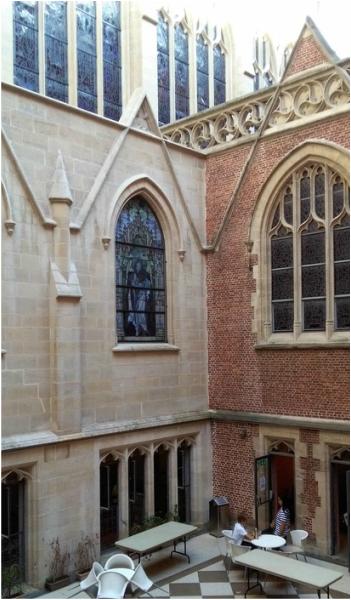 Classes are also often taught here and a reputable private school for children has been hosted in the buildings which had been the original home of the American University of Paris, now located only a few meters away. ​The diversification of the area from its origins as an exclusionary privileged community, with inhabitants native to it only by virtue of possessing the necessary financial faculties, to one of the most cosmopolitan geographical areas of Paris, is emblematic not only of urbanization, but of a growing unification; a multi-national effort to redefine foreignness and multiplicity as a globally beneficial force. But is the diversity damaging to the national identity of France? It is important to distinguish the inclusion of diverse cultural components from homogeny. Nationalism and cosmopolitanism have long been argued to be incompatible , but in the Seventh arrondissement the two phenomena rarely collide. This ideological evasion transpires out of a modern approach to foreigners that has evolved particularly in Paris. Historic clashes between races, social classes and political alignments, have left the area accustomed to handling strife . In each part of the Seventh district, one would find it difficult to observe assimilation. Rather, a trend of coexistence is rising, in which tolerance of cultural differences eclipses the tendency for one to absorb the other. "Do you ever notice the presence of other cultures in the Seventh?" I asked a local woman, a very accommodating Madame Clements, who in turn responded with another question: "Autres? Quelles autres?” I was enticed by the simplicity of her dismissal. It was not that all of the different influences have converged into one culture for her; she simply did not believe that any one culture had legitimacy to a particular place over another. This kind of blasé attitude towards cultural exclusivity raises the question: “Are we already living in a post-national world?” If we are, the borders of it are certainly confined to these cosmopolitan oases. A 33 meter long model of a whale appeared on the banks of the Seine (above) near the American Church and the American University of Paris during the COP 21 conference on climate change in Paris. Construction of the whale was an attraction for an exhibit by photographer Pierre Douay who heads an environmentalist association for the defense of the natural environment un cadeau pour la terre – a gift for the Earth. 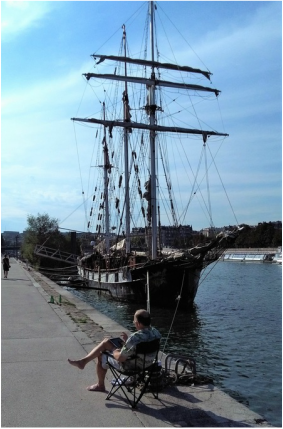 Just nearby (right), the schooner La Boudeuse, exploration vessel of another green NGO, has become a permanent feature of the Orsay Embankment, now a quiet pedestrian area contrasting with the ballet of automobiles and diplomats or businessmen rushing between offices only yards away . In order to fully intake and understand the extent and nature of the influence the district exerts, I decided I must not simply cast a superficial glance at the magnificent museums, monuments and government ministries. These institutions no doubt play an important role in establishing the unique geopolitical position of the Seventh, but they are not the only ones in need of examination. What makes the area truly a global nexus of cultures is not only the presence of invaluable French art and history, but the structural inclusion of places that do not necessarily belong in such an environment: foreign businesses, schools and embassies. I was fascinated by the views, by the streets, each ordained with foreign flags and signs. They denoted a certain grace, a subtle unperturbed confidence, in accepting that which is different. The French is still there; there is simply room for more. It displayed in its various corners a genuine kaleidoscope of cultures; a confluence of congruity, made all the more impactful by its unexpected placement within the country's national nucleus. 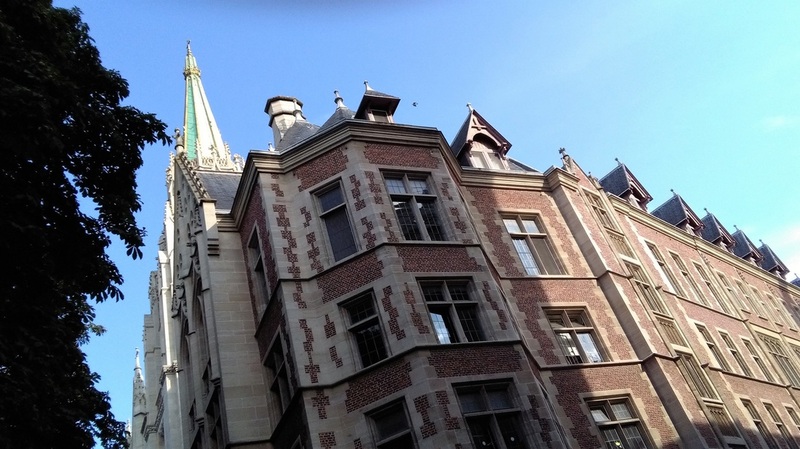 In order to showcase this diversified harmony at its peak, I ventured to examine the proximity of some major and influential French monuments and institutions to the foreign offices and businesses in the same neighborhood. This, I thought, would give me an insight into the nature and extent of the area's heterogeneity. ​The comparisons, I would find, are striking. Towering proudly over the Seine, one finds the unmistakable L'Hôtel National des Invalides, where it stood since 1679 as imagined by architect Bruant and completed by Mansart, the architect of Versailles. Initially built as a hospital for soldiers in need of care, it is now a home to many culturally invaluable exhibitions: museums such as Musée de l'Armée, the Musée des Plans-Reliefs and the Musée d'Histoire Contemporaine. Just besides the Esplanade de Invalides, on Rue de Constantine and Rue de Grenelle, one can immediately observe the Colombian and Swiss embassies. It was particularly striking that in the midst of a historical display of militarily significant buildings are seen constant reminders of ever-growing diplomacy. Not far from Rue de Grenelle is situated the Montenegrin Embassy. Irena Radovic, is presently ambassador to France. When I asked her impressions about the 7th, she answered the following. "Throughout my experience in foreign relations, I have rarely seen a place as evocative of international cooperation as the Parisian Rive Gauche" remarks. "Where cultures are in dialogue"
Although probably exceedingly lauded, the Champs de Mars exhibits many examples of cultural coexistence. An icon of the nation and a tremendous feat of engineering, the Eiffel Tower has symbiotically contributed to a great amount of foreign attention, which in turn shaped the way the area responds to the presence of foreigners. Parallel to the Allée Thomy-Thierry, on Avenue Charles Floquet, one finds the Czech Republic and Ethiopian Embassies. “This area is always welcoming and colorful,” says a worker at the Czech Embassy. In assessing the extent of foreign prominence, one must not fail to remark on the collection of non-native schools. The University of London institute in Paris is located in close reach to the Invalides. The goal behind this placement is mutual diversification, by endeavoring to “promote the study of the culture, language and literature of Paris and France.” The American University of Paris, which has strived for multi-cultural celebration and exploration of national differences, is situated in the heart of the Seventh arrondissement. Since 1962 it has been a vital intersection for cross-cultural studies under American educational values. Cultural centers have multiplied through the effort of the local embassies' initiatives; not unlike the pavilions of the World Fairs that once stood on the same spot, five times between 1867 and 1937, they represent praiseworthy features of the cultures and natural environments of their countries : Bulgaria, Romania, Canada, and China. Most recently, the Russian Federation has built (in place of the former headquarters of France's national meteorological service) a very imposing modern-style cathedral surrounded by several buildings which are planned to host schools, exhibitions and other cultural activities. This monument of soft power has been in the French national news. The recently inaugurated Jacques Chirac-Quai Branly Museum, now one of the largest ethnographical museums in the world, named after the French president, who, with his passion for the arts of first nations, lobbied for its creation, claims as its very purpose to celebrate diversity by presenting the cultures of the world's indigenous populations. "Where cultures are in dialogue" is its slogan. More than 10 million visitors, a record number, have visited the Jacques Chirac-Quai Branly Museum since its opening to the public in 2006. Some of its richest artifacts are objects created by Native Americans of the Pacific coast of Canada and of the Northwestern United States. Their art was compared by the world famous ethnographer Claude Levi-Strauss, despite its absolute uniqueness, to the great baroque masterpieces of European painting and sculpture, because of its mastery of combining imagination, complexity and harmony. A Thlingit mask from Alaska (above) proves his point. The museum was inaugurated by Jacques Chirac, Kofi Annan, two former prime ministers and Levi- Strauss himself. The pioneer of structuralism who had lobbied for such a museum enjoyed it for three more years before dying at an age 100. ​According to the prestigious INSEE (Institut National de la Statistique et des Études Économiques), the indispensable institution for the French to understand the demographics and all economic figures in their country, in 2012 there were 57,092 total residents in the Seventh arrondissement, 12% of which are estimated to have been born in other countries. These types of figures have been an indication of Paris’ (and specifically the Seventh’s) increasing placidity with dissimilarity. There are an escalating number of foreign schools, representations, and businesses from a vast number of countries. The involvement of these diverging variables makes for a Paris that is not merely exceptional, but rather eclectic. It is distinguished by its distinctions; a confluence of foreign influences in the most focused parts of France’s historical center. Murphy, Margueritte. "Becoming Cosmopolitan: Viewing And Reviewing the 1855 Exposition Universelle In Paris." Nineteenth-Century Contexts 32.1 (2010): 31-46. Warf, Barney. "Nationalism, Cosmopolitanism, And Geographical Imaginations." Geographical Review 102.3 (2012): 271-292. Acosta, Raúl. "Community, Cosmopolitanism And The Problem Of Human Commonality." Journal Of The Royal Anthropological Institute 19.4 (2013): 882-883. Johnson, Douglas. "Les Invalides, Paris." History Today 41.2 (1991): 62. Aubagnac, Gilles. "Paris, Musée De L'armée - Hôtel National Des Invalides: La Seconde Guerre Mondiale: Ouverture De Nouvelles Salles Le 18 Juin. (French)." Revue Du Louvre 50.3 (2000): 28-29. "University of London Institute in Paris." ULIP Mission and Background. N.p., n.d. Web. "INSEE - National Institute of Statistics and Economic Studies - France." INSEE - National Institute of Statistics and Economic Studies - France. N.p., n.d. Web. "Commissions Nationales: UNESCO." Commissions Nationales: UNESCO. UN, n.d. Web.